I’m currently in China having all kinds of interesting experiences. For example, it was only in Shanghai a few days ago that I saw my first wheelchair-accessible urinal. 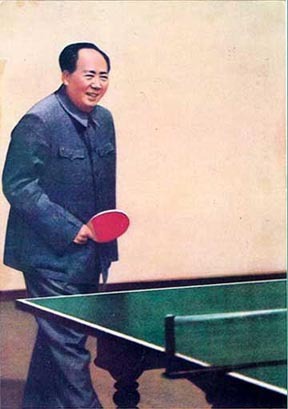 I’ve also seen more pictures of Chairman Mao in the last 2 days than I had seen in the previous . . . well, ever. I’m here for a series of meetings. Presently, I’m in Wuhan attending the Colloquium of the IUCN Academy of Environmental Law – an annual meeting of an organization dedicated to the teaching of environmental law around the world. I did not speak about animals at this Colloquium. Neither has anyone else. In fact, today’s lunch speaker presented some data about the research interests of the membership and animal law merited mention only as one the disciplines least often listed as a primary research interest. Indeed, I’m one of only 6 academy members who did list it. But not for long, by jiminy. I’ve noted before that I have begun a campaign to get the larger IUCN to recognize animal rights/welfare as part of its mission. Toward that end, I recently joined the Ethics Specialist Group of the IUCN Committee on Environmental Law. The IUCN Congress occurs quadrennially and I fully intend to have this issue before the body by the next Congress in 2012. The Academy is much smaller and meets annually. I have decided to stand for election to the Teaching and Capacity Building Committee, which is drafting an environmental law curriculum for law academics in countries without developed environmental legal regimes. If elected, I will attempt to insert the animal agenda into the foundation of environmental law pedagogy worldwide. Otherwise, I’ll do it some other way. This crusade has nothing to do with hope; I’m not hopeful. This rather involves pure instrumentalism in the face of inertia. The more people who teach animal law in more places, the more likely there will someday be some animal law worth teaching. When that occurs – if it occurs – that will be a good day. In the meantime, we do what we can. Go David!!! It’s a whole lot harder to preach to the non-converted, but ultimately a whole lot more useful. Wow; that’s quite something. It will be interesting to track the bill’s progress. which made me dig up your blog address from my notebook. Incidentally, I was in Wuhan a couple years ago (my brother and his Chinese wife were getting married in Gonghan). Being a vegetarian in China must be quite difficult, especially outside of the major cities. I’ve heard saying you’re Buddhist is the best way to go. We did in fact ford the pond, Jen! Thanks for the link and for reading. Vegetarianism is indeed a challenge over there but I’m here to tell you it can be done. Now, back from China, I’m re-energized to tackle all these pesky problems on the home front.